Following the release of iOS 10, many of our game-loving readers noticed that Game Center app is no longer available. And some of us are really upset by this change. 1.2 How do I get my game center app back? 2 What About Friends? How Do I Add or Delete Game Center Friends? 3 What Happens to My Game Now That Game Center App is History? 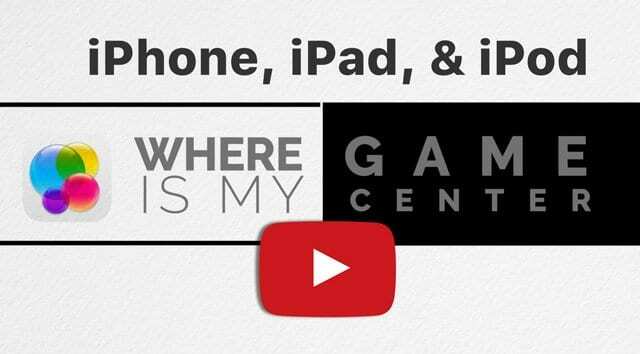 5 Want to Remove Game Data from Game Center? 8 iOS Gaming is Multi-Player Magic! 11 No Time? Check Out Our Video! But even though the app is gone, Game Center settings remain available in the Settings app in iOS 10-12. And Game Center is still part of Content & Privacy Restrictions (or in older iOS, Restrictions) and even includes an option for screen recording. It’s even a part of watchOS! 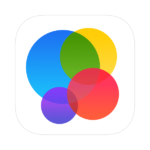 So Game Center is alive and well–just no longer an app for your home screen. So what this means for you is that while the app is gone, its functionality is still there. Think of Game Center as a service rather than an app. So for all gamers out there, your Game Center Service continues to track your best score(s) on a leaderboard, compare your achievements, invite your friends to play, or even start a multiplayer game through auto-matching. Now everything that the Game Center app did is available directly in your game’s individual app. Check leaderboards, your achievements, view challenges, send challenges, and see your turns–all inside the game app itself. If you want to manage your Game Center account, you do that in Settings. If you would like to change Game Center accounts, tap your Apple ID in Settings > Game Center > Apple ID and sign out. Then sign back in with another Apple ID. For an easy way to manage multiple player accounts in Game Center, check out this article on how to use iOS 11’s feature to save IDs and passwords in Settings > Accounts & Passwords. How do I get my game center app back? You can’t, unless you want to downgrade your device to iOS 9–and that’s a lot of trouble! Plus you miss out on all the great iOS features in the later iOS versions. What About Friends? How Do I Add or Delete Game Center Friends? If you want to manage your friends, you do that in the game app or add new friends using Facebook, if the game app is linked to your FB account. Unfortunately, though you still have your friends list in Game Center Settings, you can’t delete friends individually when using iOS 10-11.2.6. You either delete them all or none at all. Consequently, Game Center for iOS 10-11.2 no longer allows you to add friends. All those things are now done through the individual game app or through games that link and sync to your social media accounts–like FaceBook etc. With iOS 11.3, Apple finally introduces a way to delete individual Game Center friends–something we’ve waited for since Game Center became a service instead of an app! Starting in iOS 10 through iOS 11.2.6, your choices for friend management in Settings > Game Center were limited to Remove All Game Center Friends or nothing! But with iOS 11.3+, there’s a new Friends option from the Game Center Settings Menu that allows you to add or delete friends individually. Finally! What Happens to My Game Now That Game Center App is History? 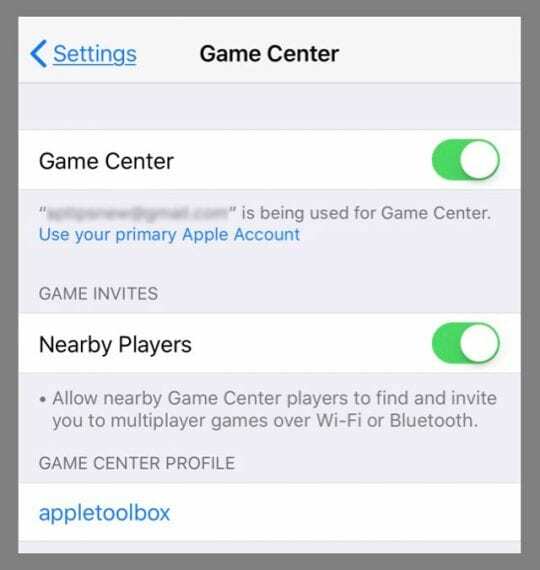 If your game is saved to your Apple ID, try logging out and then logging back into and then connect to game center from within the game itself. Performing those steps should restore your game progress and info. And even though the Game Center app is gone, your game data is also likely stored safely on the individual game app’s or social media’s (like FaceBook’s) servers. These servers should retain all your Game Center info. If you updated to iOS 10 and don’t see your game data when opening a game, open Settings > Game Center and sign back into your Game Center account to restore your game’s previous progress and any other information. Once your game connects to Facebook, add (or remove ) Facebook friends and ask them to join a game! If you’d rather not use Game Center now that it’s not a fully supported App, there is an easy way to unlink your game from Game Center. 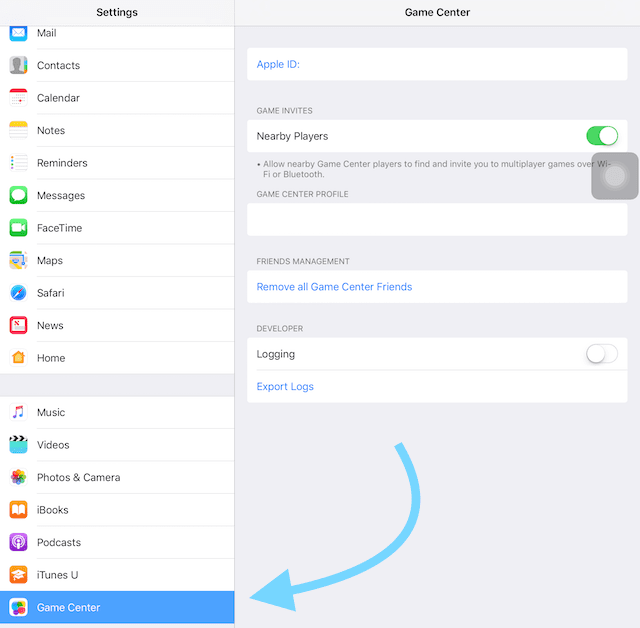 Want to Remove Game Data from Game Center? If you backup Game Center AND the specific game app’s data via iCloud, you can manage the storage on your iDevice or Mac. Choose Delete Documents and Data–this deletes that games data from all Apple ID connected devices! If you are sick and tired of seeing that welcome banner each and every time you open a game that supports Game Center, there’s good news! Removing that banner is as easy as changing just one setting. Go to Settings > Notifications > Games and turn off notifications. Adding friends and inviting them to games is now handled by the individual game apps using iOS 10’s expanded Messages app. So starting in iOS 10, within your game app you send a message to anyone in your Contacts and are immediately able to play a game with them. These messages are sent to your contacts as Game Center notifications. You no longer add friends to Game Center. Instead, you invite people to play via iMessage for supported games. Game Center support is implemented by each app developer. So it’s no longer Apple’s global responsibility but rather a game-by-game feature. Beloved Game Center features like leaderboards and achievements now show up individually in your game apps. Invitations are sent to players from your contacts, to recent players seen online, and even nearby players on a local network playing the same game. Players with legacy Game Center accounts also receive notifications from iMessages invites. Or send a rich attachment link to the game through the app store’s share button. The invitation is sent as an attachment in iMessage to another iPhone or iDevice user. One caveat is that everyone must have an Apple ID and an iCloud account to work. With iOS 10+, we get to play games inside of Messages by downloading within iMessage itself. How cool is that? While playing an iMessage game, you can continue chatting and messaging with others as normal. And having multiple active games in a single conversation or in multiple conversations is also possible. So play a bunch of different games with as many friends and family members as you want–all at the same time! iOS Gaming is Multi-Player Magic! 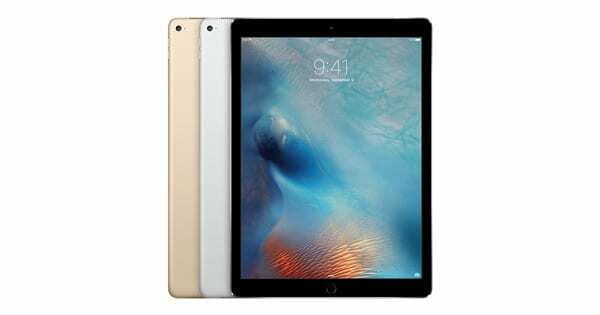 iOS 10+ is optimized for amazing multiplayer gaming experiences. A single game session now holds up to 100 players, along with smaller sessions of one, two, four, twelve, and so forth up to the 100 player maximum. You’re also able to set-up multiple players into teams! 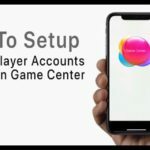 Because Game Center is now specific to individual game apps and iMessage-based, you invite and play with anyone that you message for a true multiplayer gaming experience. It’s also easy to send messages to multiple players or between players. These messages appear as Game Center notifications. 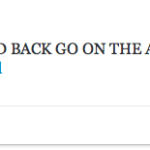 And players can send messages back and forth. Any player can send a message at any time; there are no restrictions. Gaming on your iPhone or iPad is iCloud-based, so game data is shared and saved on each player’s iCloud account. This is what allows you to play with anyone with an iCloud account. But all your game data comes at a price. Your game data is now stored in your iCloud account, and it does count against your iCloud limit. So if you are a heavy gamer, you might need to upgrade your iCloud account to one of the larger plans. Remember that each iCloud account comes with 5GB of storage at no cost. However, your iCloud account is for everything–not just games. If you experience challenges in playing games with your friends, getting an invite, or sending Game Center messages back and forth, here are a few tips that might just turn things around. These three steps above should help in solving many game center issues. Playing games on your iOS iDevice is fun! And now we enjoy playing on our Apple watches too. Even though the Game Center app is gone, the support and many of the features are not. So go ahead and challenge your friends, take a peek at leaderboards, and invite your friends, contacts, and even those nearby to play–all now directly through each game’s app rather than Game Center app. To browse games, visit the App Store. 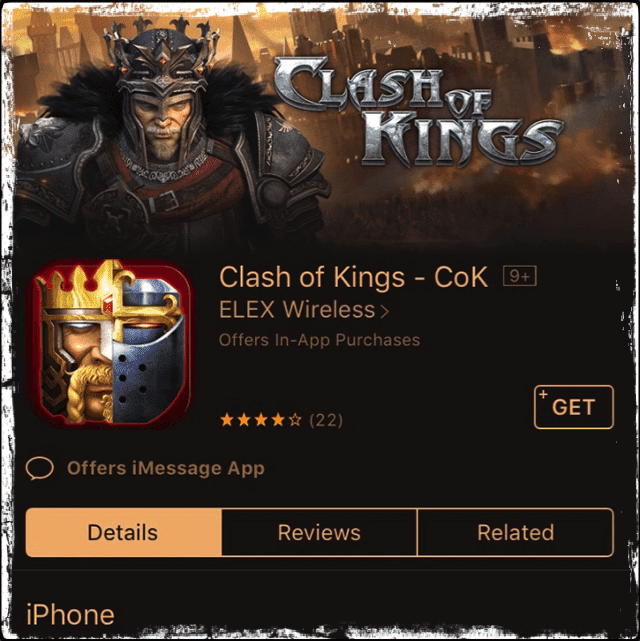 Look for games that list “offers iMessage App” for the best iOS10-11 iMessage gaming experience. So go ahead and send and receive Game Center invitations in Messages and tap on the link to take you directly to the game. And remember, if you don’t have that particular game installed, the link opens the game’s page in the App Store. When I’m in the Game Centre I can’t open my Game Centre Profile. It says ‘ update your account’ stating there was ‘ an error communicating with the server’. I’ve updated my Game Center account, turned my iPad off then on and force closed it, what could be the problem? I’m also having an issue connecting to a game I play for cash, could this be connected? I am missing some of my friends from Game Center on Hay Day on my iPad. They are all on my iPhone in Hay Day. How can I fix this? Check if your iPhone and iPad are signed in with the same Apple ID and have Game Center toggled on in iCloud–go to Settings > Apple ID Profile > iCloud > Game Center. If it’s toggled off on either device, toggle it on so both devices have this setting on. On each device go to Settings > Game Center and toggle on Nearby Players. 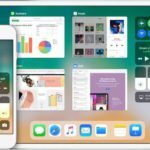 Then, close all open apps, in particular, Hay Day, by double pressing the Home button or swiping up the Home Gesture Bar and swiping up off the top of your screen all open apps–do this for both the iPhone and iPad. Then restart both devices by powering off, waiting 20-30 seconds, and powering back on. If you still don’t see your friends on your iPad, try reinviting them. If only I trusted Facebook! I lost my Hay Day game when changing phones. How can I get it back? First, make sure you are signed into Game Center (settings > Game Center and verify it’s on and connected to the correct Apple ID. Then open the App Store and search for Hay Day there. Download and install it. Or, if you like to see your previous app purchase, open the App Store, tap the Today tab at the bottom, then tap the profile icon in the upper-right corner. From the menu, choose Purchased > My Purchases (or a Family member if that’s applicable) and locate Hay Day–tap the cloud to install. Yeah ok makes sense but I’m an achievement hunter and I keep getting achievements on some games but I can’t see my progress or what achievements I still need. This is frustrating to me. Anyone know how to check achievements? I just want to throw my iPad across the room!!! With the change of the Game Center I can’t get on to most of my games to open and the few I can I have lost everything. It requires me to keep entering my passwords every time. Since the update when I try to read emails it’s loading the emails but then closes itself out. We have turned it off and on with no luck. This is one of the dumbest things that Apple has ever done! Most of us game with complete strangers as gaming buddies, not as friends we know IRL (in real life)! Most of my friends would not be interested in the games I play. Sending them a random invite would be pointless and unwelcome. Apple needs to reintroduce allowing us to give out our Game Center ID so that we can connect with people all over the world who like to play the same games as we do. This new system is absolutely pointless and broken. Absolutely b*S. This change did not make apple better. I like the app better. Thanks for pointing out the changes to GC friends in ios11.3. Still, I’d like to see Apple bring back the App. 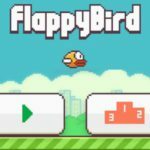 How do I transfer my games, points, and levels from my old I-phone to my new one ? If you notice that a game is not accurate on your new device BUT is accurate on the older, manually delete that game and reinstall it via your storage tools. I have a iPhone 6 and i just update my iPhone 6 11.3 and i have game a that have deal with game center and i’m trying to see why i can’t add people to game center or see my game center? I have a iPhone 6 and I’m trying to see why i can’t find my game center or add friends that have a game center. Sorry to hear about your issues with Game Center. 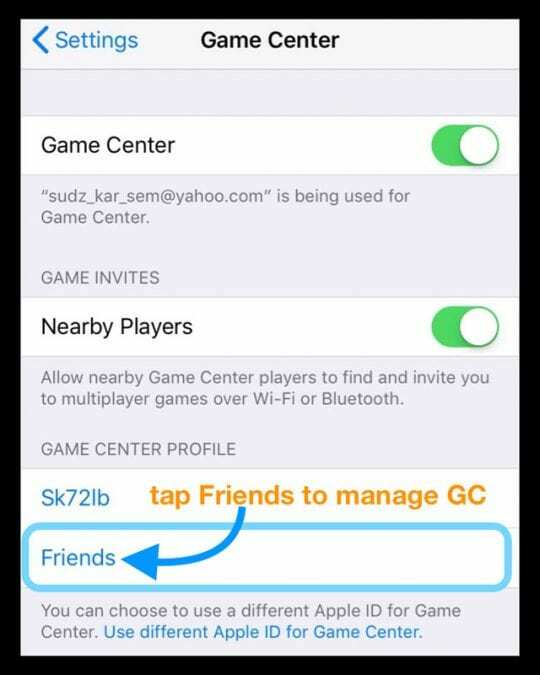 In iOS versions 10-11.2.6, Game Center removed the function to add/remove friends. However, in iOS 11.3, that function returns. You find it in Settings instead of the App (the app was removed in iOS 10.) Go to Settings > Game Center > and under Game Center Profile, tap Friends. To add friends, you must add them via the individual game app–they should then show up under “Friends” in the Game Center settings. Since this is a new functionality in iOS 11.3–let us know if you encounter problems. Hi, i play family farm . Touch 130 level. Spend lots of pounds and this morning game restore . I am sad and dont fill well. Play more then 5 years. Please help me beck my farm. Sorry to hear about your Boom Beach game status. First, close the app by double pressing Home and swiping up off screen the Boom Beach app preview. If you linked to Game Center, log into your Game Center account via Settings > Game Center and then open Boom Beach again. Any game play stored in GC should show up. Make sure you connect your to a unique Game Center ID moving forward to save your game play. Game Center is ridiculous. I hate the way it is set up now. People that want to be friends with you to play the game can’t unless they are on social media and some people aren’t on it. So how the hell do they become friends and play the game if they aren’t on social media. I give this app a 0 out of 10. It is not user friendly at all and I think it wasn’t a good idea to change it. I even tried their “screen name”@gamecenter.com . Should i be addressing it to “screen name”@icloud.com instead? Since everyone i think has to be with icloud as GC players??? Nothing happens and usually it fails when i do to GC but it does often send,,,.. a couple of times it sent but no response… and PEOPLE are sending them to me yet it shows up in the app and not in iMessage… yet we have no ability to chat in this game so i cant ask them how or what their email address is… help… there is a work-around but no one is mentioning it…. Unfortunately, Apple did not make this transition from the Game Center App to the Game Center Service very smooth or user-friendly. It’s been a really confusing year without the Game Center App and though Apple said it would support legacy Game Center accounts, their record of doing so is spotty. Ultimately, Apple placed the burden of integration between Game Center (and its users) and Game Apps onto the game developers themselves. That means that the game developer must spend the resources and time to integrate with Apple’s new Game Center Service to preserve user data, friends, and user data. 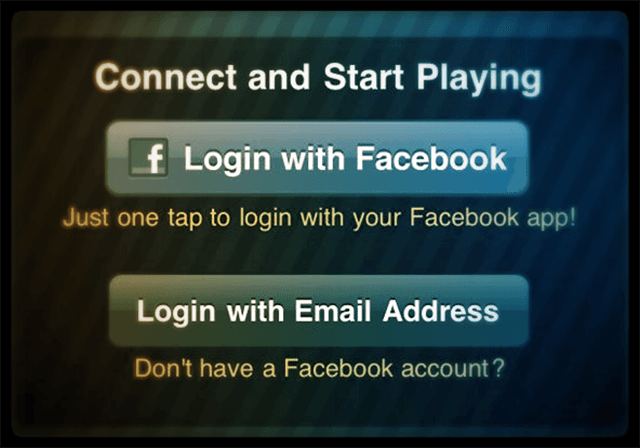 Ultimately, many games chose to abandon Game Center and use Facebook for their user and invitation management. That means that some games that worked with the Game Center App no longer work with iOS 10+ Game Center Services. And we’re still trying to figure this whole transition out–1 year later! First, make sure you’re signed into Game Center on iCloud. Go to Settings > Apple ID Profile > iCloud and check that it’s toggled ON. If it already is toggled on, turn it off, wait 20 seconds, and then turn it back on again. Next, open your game and find the settings menu within the game. Check that any toggles for invites, online friends and notifications are all on. Then navigate to Invites, invitations to play (it’s called other things too but the point is to invite someone to play.) Some games include a lookup tool for usernames, so if you know their username, it automatically sends a Messages-based invite to them. This texting replaces the old method of inviting friends to play. 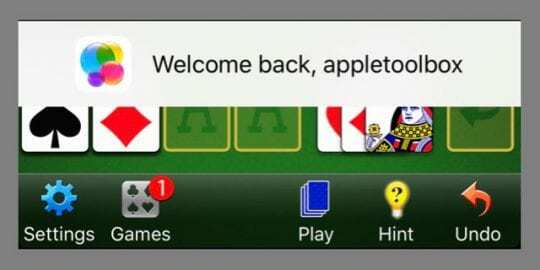 I don’t know which Gin Rummy App you’re using and each game’s design is different. But if it supports Game Center (you see the welcome back banner,) these function should be there. 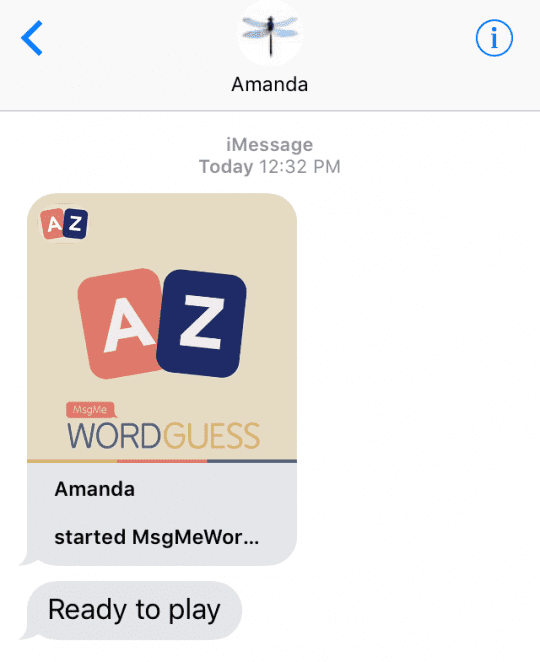 For example, I found some of my friends by using their Game Center nickname (or username) and sent an invite using the Username lookup tool in the game “Words With Friends”. When I send that invite to play, the game itself sends a rich link to that friend through iMessage. Then when they tap that message, it takes them into the game. As mentioned, not all games support this behavior. It needs to be implemented by the Game’s developers instead of Apple. So it’s a per-game feature. If your game doesn’t have a lookup tool, see if your game has your game history and look for your friends this way. If not, look at the leaderboards, achievements, or trophy sections and see if any of your friends are listed and then challenge them to a game. A final thing to check is if your Gin Rummy game is using Facebook to manage friends. If so, sign into Facebook and see if this makes any difference. Is there any way I could still send or receive a friend request? The game I wish to collaborate in (pocket frogs) doesn’t allow you to do so within the app. I am unable to send frogs, view other habitats etc. without becoming friends and since we were not friends before the update I cannot search for them, recieve their requests, or view their profile. Please advise me if or how I might regain these features? I looked into Pocket Frogs to see if there’s a way to send and receive friend requests NOT using Game Center. The only way to send and receive friend requests for Games (using iOS10 or later) is via iMessage. For this to work, the game must offer an iMessage app, which Pocket Frogs currently does not offer. Since the release of iOS10 almost a year ago (September 2016), Apple moved the management of friend requests etc. to iMessage and onto individual game developers. According to Apple, this is a feature individual game developers wanted. So, in order to have this functionality, you must make the request to the game developer. I’m sorry that I don’t have better info for you. I used to have three game center accounts, but now I only have two. When I signout of the game center and attempt to sign in again, it always recommends the account I no longer use. How do I change the default suggestion login account? I used to have three game center accounts, but now I no longer use one of them. When I sign out of game center and sign back in, game center asks me if I would like to sign in with the account I no longer use. How can I change the default setting (suggested login account) to stop suggesting this unused account? To completely delete the unused Apple ID from Apple’s side, you need to call Apple Support. Check out this article for the details. I like having my online gaming friends separate thru Game Center from my personal FB friends. Now Game Center sticks. I can’t even view my GC friends with photos anymore? They really need to fix this and go back to the way it was. how can i get my sons game info removed from my game center service so i can have mine save there with our opening a whole new itunes account? What a hassel! With the removal of the Game Center app, the only way to control things universally is to go to Settings > Game Center and change the Apple ID from your son’s account to your own Apple ID account. The other alternative is to go to those games one by one and disconnect them from your son’s game center (Apple ID) account. That is likely a pain! Unfortunately, at this time each iDevice is only allowed one official Game Center account, connect to 1 unique Apple ID. I wish I had better news, but that’s the deal right now. How do I delete a game that is connected to my Game Center account? Is there a way to turn off the challenges now? Before you could actually turn off that functionality in the app and now there simply isn’t as far as I can tell? Not really what I would call fun to be honest.